(Nanowerk News) After countless fictional scenarios of humans making contact with alien civilisations, you’d think we’d be prepared for actually discovering one. But finding intelligent life beyond the Earth is clearly likely to be one of the most shattering moments in the history of our species. So if you’ve just discovered an alien civilisation, how should you go about breaking the news? This is a momentous task, and I have been involved in developing some guidelines for the scientists who are involved in searching for extraterrestrial life. The research is due to be published in the journal Acta Astronautica ("#FoundThem - 21st Century Pre-Search and Post-Detection SETI Protocols for Social and Digital Media"). With the millions of dollars currently being invested in initiatives such the Search for Extraterrestrial Intelligence (SETI), some would argue it is only a matter of time before we do come across intelligent life. I’m personally not convinced, but pessimism isn’t enough to abandon a search. The scientific method requires us to test our hypotheses with observation and experiment – regardless of our initial prejudices. If we ever do find signs of intelligent life, I don’t expect it to be a message from an alien civilisation or a landing party. It will probably be something a little more prosaic, such as signs of artificial pollution in the atmosphere of an exoplanet. It may even take the form of enormous structures built in space to collect energy and provide habitats. I showed in some work ("On the Possibility of Detecting Class A Stellar Engines Using Exoplanet Transit Curves") a few years ago that we would be able to see such megastructures in exoplanet transit data, such as that gathered by the Kepler Space Telescope. True enough, Kepler did see weird objects such as Tabby’s Star ("Planet Hunters X. KIC 8462852 - Where's the Flux? "), KIC 8426582, with features similar to those predicted would come from artificial structures. 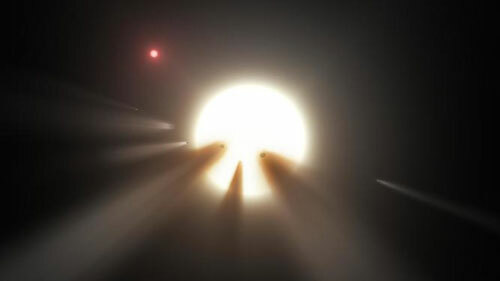 But like most astronomers, I’m still a sceptic – a swarm of comets around Tabby’s Star producing incredible changes in brightness is still the more sensible interpretation. What’s really encouraging about this, though, is that it shows SETI can be done “on the cheap”, taking advantage of publicly available astronomical data to search for aliens. For a pessimist like me, this seems like a much more appropriate strategy. The flurry of internet activity surrounding Tabby’s star – blogs, tweets, news stories and the Kickstarter campaign to encourage the public to support further observations – demonstrate how different the world has become since SETI began around 60 years ago. If evidence of extraterrestrial life ever came to us from the stars, what should the discoverers do next? This is something astrobiologists have pondered for decades. In 1989, a committee of SETI scientists even drew up a set of post-detection protocols to guide scientists through the steps after discovery. These steps include getting your colleagues to verify the discovery, and notifying “relevant national authorities” (precisely who this means is unclear to me), followed by the scientific community and then the public via a press release. However, this set of guidelines was written before the age of the internet. Back then, we got our news via the paper or the TV screen. Even 24-hour news was in its infancy. Nowadays, the news world is a fragmented sphere of articles placed on our devices and in our feeds via a variety of social media tools, shared by our friends and family. Data flows extremely rapidly, and easily gets amplified and distorted. That is why my colleague Alexander Scholz and I decided to take another look at the issue, asking how the SETI post-detection protocols should change to reflect our super-connected world. We quickly realised that scientists need guidance before starting the experiment, let alone after making a detection. It is now common practice for new scientific projects to set up a blog about their work, and this will be essential for SETI. The blog should include a clear description of what a certain project will do, and what the criteria are for a successful detection, a false positive and no detection. This would help journalists and the public alike to avoid misinterpreting the results. The individuals involved need to be credible communicators of their work, so maintaining good digital presence in the early stages is very helpful. We also recommend they update their security settings to protect against nefarious individuals broadcasting their personal information – which is sadly a real risk these days. If a team is lucky enough to make even an unconfirmed, tentative detection, they must be sure to have nothing to hide. Leaks are unavoidable, and alarmingly rapid. Nobody wants an “aliens found” story that turns out to be false. The best way to do this is to publish data immediately. If it’s very clear that the detection is unconfirmed, and natural or man-made causes can’t be ruled out, then there is no room for conspiracy theorists to wail about the scientists' collusion with the men in black (an accusation flung at me more than once). It also gives other scientists the chance to check the work, and verify the detection. Of course, we’ve all seen some of the comments on YouTube or other media sites – there are numpties everywhere, and there is seemingly no stopping good scientific discussion being twisted into inexplicable diatribes and vile hate speech. Therefore, the most important piece of advice for scientists is to be involved in the conversation. If a publicised detection turns out to be false, the team should immediately make a public statement making it clear that no aliens have been discovered and why. They should even publish a paper retracting it if they have to. But whoever discovers intelligent life should also prepare for it to swallow up the rest of their life – there isn’t going to be time for much else. Their new job will instead be to help humanity come to terms with its new identity, as just one of multiple intelligent civilisations in the universe.